The successful capability enhancement for the H145M continues. 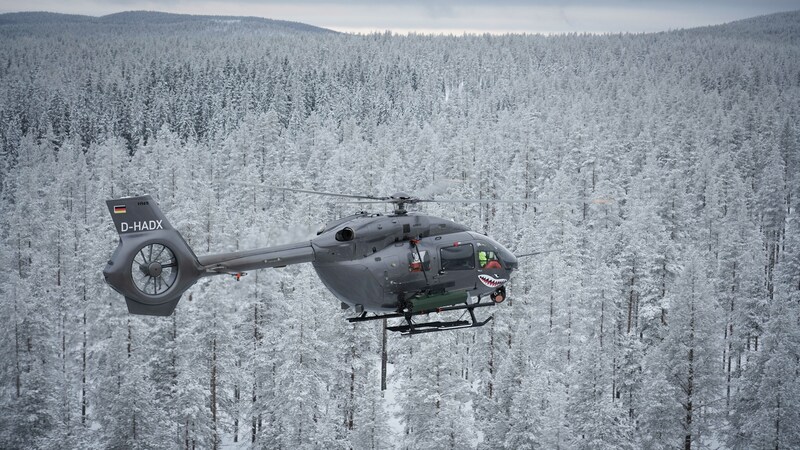 In the first weeks of December 2017, Airbus Helicopters demonstrated the ability to fire laser guided rockets (FZ275 LGR from Thales) with its new H145M platform at the Älvdalen test range of the Swedish Defence Materiel Administration Flight test Centre. In a rough and challenging environment the system performed flawlessly. The electro-optical system (MX-15D) from L3 Wescam with embedded laser designation enabled a deviation of less than a meter for all rockets fired at a distance of up to 4.5 km/2.8 miles. This 70-mm/2.75-inch laser guided air-ground rocket enhances the H145M’s engagement capabilities. It fulfils the precision strike needs of the armed forces worldwide by reducing the risk of collateral damage, particularly during asymmetric combat operations. «The laser guided rockets from Thales performed incredibly well especially taking into consideration the weather conditions we experienced during the trials which were far from ideal with a lot of moisture in the air», said Raymond Laporte, test pilot at Airbus Helicopters. Following the success of the ballistic firing tests, held in Hungary in October 2017, the achievement of this new milestone with laser guided rockets is in continuity of Airbus Helicopters’ HForce development strategy to boost the H145M mission capability. Final qualification of the ballistic HForce system on the H145M is scheduled for end of this year, while the laser-guided rockets is planned for end 2019.